Sometimes, when you have writer's block, the only thing you can do is post a picture of your girlfriend in a dress. 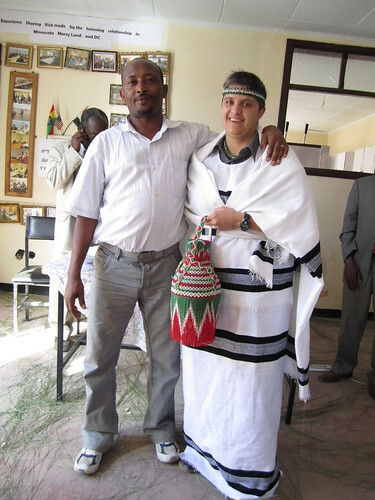 Not sure if you have seen my status update but not only did I get to enjoy a coffee ceremony, popcorn and all, I also was gifted a cultural dress which I had to put on in front of the entire group of people. As you can imagine I loved it. Anyway, I am attaching a picture so you can have a good laugh! Love you lots, Luisa. Luisa doesn't wear dresses. In fact, under that lovely frock, she is wearing men's dress pants and a men's dress shirt. All of this makes this picture absolutely perfect.